1. 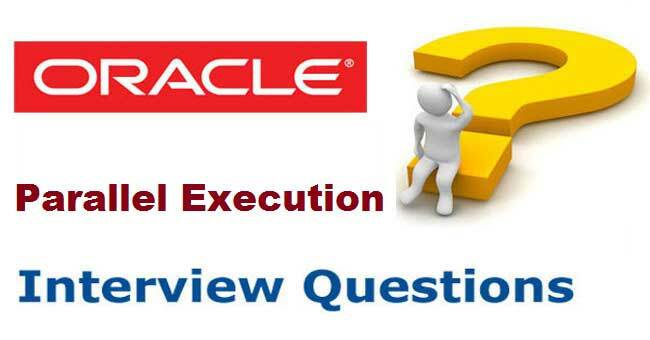 What is Oracle Parallel Execution? Parallel Execution allows Oracle to perform specific database actions in parallel. 2. Which subtypes of Parallel Execution exist? See note 806554 for more details. The most important Parallel Execution type is Parallel Query. Therefore this note focuses on the Parallel Query type. Nevertheless, the technical details apply in the same way also to the other Parallel Execution types. 3. What are the advantages of Parallel Execution? Based on Parallel Execution you are able to use more system resources like CPU or I/O at the same time for a specific operation. As a consequence the total runtime can significantly decrease. 4. What are restrictions and disadvantages of Parallel Execution? Executing an operation in parallel involves increased resource usage (e.g. CPU or I/O). In the worst case, a bottleneck situation can be the consequence and the whole system performance is impacted. If a Parallel Execution is performed with DEFAULT degree, a very high parallelism is possible. In order to avoid this it is usually recommended not to use the DEFAULT degree. Note 544521 describes how to switch off the DEFAULT degree in PARALLEL hints generated by BW functionality. Activated Parallel Query can significantly impact the calculations of the Cost Based Optimizer (see note 750631). In the worst case a good (sequential) index access can turn into a long running (parallel) full table scan. Parallel Query requires the CBO because the Rule Based Optimizer isn't able to handle it. If the CBO is used for an access on tables without statistics, this can cause performance problems. See note 176754 (4) for more details. If a parallel DDL operation like ALTER INDEX REBUILD PARALLEL is performed, the parallelism degree for the index remains even after the DDL operation is finished. As a consequence unintentionally parallel query might be used. In order to avoid problems you have to make sure that you reset the parallelism degree of the concerned segments to 1 after the DDL operation. The BR*TOOLS perform this activity automatically after parallelized DDL operations. Due to the Oracle bug described in SAP document 985118 it is possible that Parallel Executions return a wrong result set. With older SAP releases parallel query is not taken into account in the explain functionality in transaction ST04 or ST05 (see note 723879). As a consequence misconceptions and irritations are possible. Parallel query can consume significant amounts of shared pool memory for communication purposes. Particularly in the case of high values for PARALLEL_MAX_SERVERS and PARALLEL_EXECUTION_MESSAGE_SIZE up to several GB of shared pool memory can be allocated. A consequence can be ORA-04031 errors (see note 869006). It is not possible to use parallel DML in combination with (unpartitioned) Index Organized Tables (IOTs). 5. How is Parallel Execution performed on a technical layer? The Parallel Execution Coordinator (later on referred to as "coordinator") is the control process that distributes the work across the Parallel Execution Slaves. As of 10g the original SQL statement is passed to the Parallel Execution Slave without any transformation. The producers read the source data and pass it to the consumers or the coordinators. The consumers take the data from the producers and process it. Consumers are only needed if the data from the producers needs to be post-processed (e.g. sorted). Usually small compared to "PX msg pool"
Blocks that are read via Parallel Execution are always read directly from disk bypassing the Oracle buffer pool. For more information about this "direct path" operation see the "direct path read" section in note 619188. In order to make sure that the most recent data is read from disk a segment specific checkpoint is performed before the "direct path read" operations are started. 6. Which parameters exist in relation to Parallel Execution? CPU_COUNT is a parameter that reflects the number of CPUs on the database server. It is used for several Oracle internal purposes and also influences the DEFAULT parallelism used by Oracle (see below). As CPU_COUNT influences Oracle at a lot of locations, the default value should not be changed. This parameter determines the size of the communication buffer between the different Parallel Execution processes. In order to avoid a bottleneck, it's recommended to set this parameter to 16384. This parameter can be used in RAC environments in order to restrict Parallel Executions to a sub set of the existing RAC instances. With this parameter the maximum number of simultaneously active slave processes can be specified. If more slaves are requested at a certain time the requests are downgraded and a smaller parallelism is used. SAP recommends setting this parameter to 10 times the number of CPUs available for the Oracle database in OLAP and Oracle 10g environments. This parameter specifies how many slave processes are created during database startup. If more slaves are needed, they are created on demand. It's recommended to keep this parameter on the default of 0 in order to avoid unnecessarily started slave processes. This parameter influences the DEFAULT parallelism degree (see below). In order to avoid overload situations with DEFAULT parallelism it's recommended to set this parameter to 1. When this parameter is set to TRUE (what is default for Oracle 10g) parallel executions may be downgraded by Oracle even before PARALLEL_MAX_SERVERS is reached in order to limit the system load. If you need to guarantee maximum parallelization (like during reorganizations or system copies) it is advisable to set this parameter to FALSE. During normal operation the value TRUE should be okay because resource bottlenecks can be avoided. 7. How are activation and degree of parallelism determined? The operation must be parallelizable (e.g. full table scan, scan of partitioned index). An index range scan on a non-partitioned index e.g. can't be performed in parallel. The parallelism must be activated on segment or on statement level. If <degree> is a positive number, up to <degree> producers and <degree> consumers can be used for a parallel query (-> 2 * <degree> slaves). If DEFAULT is specified for <degree>, CPU_COUNT * PARALLEL_THREADS_PER_CPU producers and CPU_COUNT * PARALLEL_THREADS_PER_CPU consumers can be used for a parallel query. If the PARALLEL_MAX_SERVERS limit is exceeded taking into account all simultaneously active Parallel Executions, the degree of parallelism is reduced. 8. To what extent does SAP use parallelism on segment and statement level? Per default no segments with activated parallelism are delivered by SAP. Parallelism on statement level (-> PARALLEL hint) is frequently used in BW environments (e.g. in case of aggregate rollup). In OLTP environments the PARALLEL hint is used only in exceptional situations. 9. How can segments with activated parallelism be determined? 10. How can the parallelism degree of segments be modified? 11. How can you determine to what extent the parallelism is downgraded? 12. Which wait events exist with regards to Parallel Execution? The following are the main wait events in the area of Parallel Execution (see note 619188 for more information on Oracle wait events). As it is difficult to distinguish between idle events and busy events in the area of parallel execution, these two types are not distinguished. A slave waits for acquisition by a coordinator. This is a real idle event. The coordinator waits for slaves to finish their work. A consumer waits for data from its producer. A slave waits for further instructions from the coordinator. A producer wants to send something to its consumer, but the consumer has not finished the previous work, yet. The same is valid for a slave that want to send something to its coordinator. In order to tune this wait event you have to check why the consumer / coordinator is not able to process the producer data fast enough. For example deactivated parallelism for DML operations can result in high "PX Deq Credit: send blkd" waits for parallelized activities containing DML operations (e.g. INSERT ... SELECT). In this case "ALTER SESSION ENABLE PARALLEL DML" can optimize the parallelization. If an SAP process fetches record by record from the database using parallel query and performs some processing on ABAP side in between, parallel execution slaves wait for "PX Deq Credit: send blkd" during the ABAP processing. In this case huge wait times for this wait event and huge elapsed times for the SQL statement can be seen although the real execution time on database side is very small. In this scenario "PX Deq Credit: send blkd" can be treated as an idle event. A consumer has to wait for its communication queue to be available. Make sure that PARALLEL_EXECUTION_MESSAGE_SIZE is set to 16384 in order to avoid many small communications and reduce this kind of contention. Another possible reason for "PX qref latch" waits is the fact that the consumer (or coordinator) processes the data slower than the producer generates it. In this case further optimisation is hardly possible. These wait events are related to process communication: The coordinator waits for an acknowledgement of a control message ("PX Deq: Signal ACK") or join request ("PX Deq: Join ACK") from a slave or processes need a queue buffer in order to send data ("PX Deq Credit: need buffer"). It is normal that these events occur (and so Oracle treats them partially as idle events), but if you have doubts that too much time is spent for communicating, you should check for overall resource bottlenecks (e.g. CPU) and unnecessary parallelization of small tasks. The coordinator waits until the slaves have parsed their SQL statements. In case, of increased waits for "PX Deq: Parse Reply" you should check if the shared pool is sized sufficiently (note 789011) and if there are some parallel query SQL statements with a high parse time (note 712624 (24)). The coordinator waits for a reply from another instance in RAC environments. This can e.g. happen if Oracle parameters are set system-wide using ALTER SYSTEM. To a minor extent waits for "reliable message" can also show up in non-RAC systems. The "query server process" latch is allocated if additional slaves are created. This is necessary if more slaves then defined with PARALLEL_MIN_SERVERS are needed. In order to optimize this kind of latch wait you should check on the one hand side if Parallel Execution is activated by accident (e.g. on segment level) and switch it off in this case. Alternatively, you can consider setting PARALLEL_MIN_SERVERS to a higher value. 13. Where can I find more information about Parallel Execution activites on the system? The view V$PQ_SYSSTAT contains general information about Parallel Execution activities like number of Parallel Queries, Parallel DML and Parallel DDL or currently active sessions. This view contains information about the existing parallel query slaves. 14. How can the progress of a parallelized full table scan be monitored? directly (not via role) granted. Usually not even the user 'SYS' has these privileges granted directly. Doublecheck if the character '|' is copied when you cut and paste the function definition. If you are sure that there is no other parallel query running concurrently then you can also set <SID> equal '-1'. If - against the prerequisite - another query runs then the percentual value is undefined. 15. Which error can show up in relation to Parallel Execution? This error indicates that a parallel query process had to terminate due to an error situation. As described in note 636475, the ORA-12801 is a secondary Oracle error code. You have to check for the real error message that accompanies the ORA-12801 error. This error indicates that a parallel query process terminated in a hard way. In this case you have to analyze trace files and the alert log for more information. 16. How does the INSTANCES setting influence the parallelism? The INSTANCES storage parameter is mainly intended for RAC environments and has a similar effect like the PARALLEL storage parameter. In order to avoid confusion it is recommended not to use the INSTANCES parameter setting. 17. How can parallelism be activated on session level? While PARALLEL QUERY and PARALLEL DDL are activated per default, PARALLEL DML has to be activated explicitly if required. This can e.g. be useful in case of parallelized BRSPACE online reorganizations. Per default only the reading of the source table is parallelized while the writing into the target table is done sequentially. By activating PARALLEL DML the writing can be parallelized.